We are less than 5 minutes’ drive from the Via Jervis management centre (base for Vodafone, Olivetti and Wind) and just 1 Km from the Ivrea Motorway exit (A5 Turin/Aosta). From the Crystal Palace Hotel, you can also easily get to the centre of Turin by train, with departures and arrivals from Ivrea station about once an hour. There is also a regular bus service. The Ivrea area is served by an extensive regional bus network operated by two companies, Sadem and GTT, and providing fast services to many cities and airports. The train is also a convenient way to reach the Hotel Crystal Palace. The Turin – Aosta line allows you to travel easily around the territory, using either regional trains which stop at all the stations or direct trains which only stop at the main stations. You can get to us easily by car, in fact we are only 2 km from the Ivrea motorway exit (A5 Turin/Aosta). The nearest airport is Turin Caselle, situated south of Ivrea and only 40 minutes’ drive from us. If you choose to fly to Milan, both Milan Malpensa and Milan Linate airports are a little more than 100 Km from us (about 1 hour on the motorway). You can book a taxi pick-up service in advance, to take you from the airport to our hotel. Just contact us on: (+39) 0125/613060, or email us at: info@hcrystalpalace.com. Ivrea town centre – 3 km. Ivrea railway station – 1.5 km. Ivrea motorway exit: (A5 Turin/Aosta) – 3 km. Turin city centre- 50 km. Aosta town centre – 70 km. 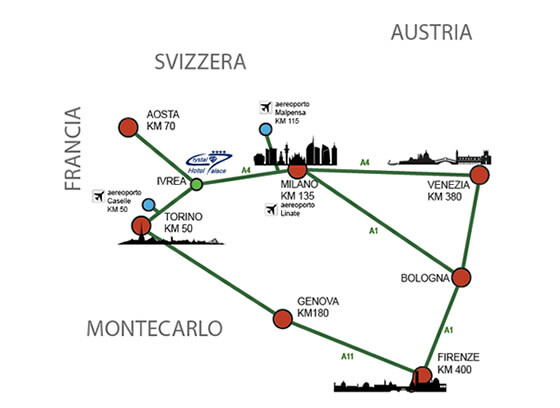 Milan Malpensa airport – 115 km. Milan Linate airport – 135 km. Mont Blanc tunnel (France) – 115 km. Little St. Bernard pass (France) – 125 km. Great St. Bernard pass (Switzerland) – 110 km.